Background: The Hvidoere Study Group on Childhood Diabetes has demonstrated persistent differences in metabolic outcomes between pediatric diabetes centers. These differences cannot be accounted for by differences in demographic, medical, or treatment variables. Therefore, we sought to explore whether differences in physical activity or sedentary behavior could explain the variation in metabolic outcomes between centers. Methods: An observational cross-sectional international study in 21 centers, with demographic and clinical data obtained by questionnaire from participants. Hemoglobin A1c (HbA1c) levels were assayed in one central laboratory. All individuals with diabetes aged 11–18 yr (49.4% female), with duration of diabetes of at least 1 yr, were invited to participate. Individuals completed a self-reported measure of quality of life (Diabetes Quality of Life - Short Form [DQOL-SF]), with well-being and leisure time activity assessed using measures developed by Health Behaviour in School Children WHO Project. Results: Older participants (p < 0.001) and females (p < 0.001) reported less physical activity. 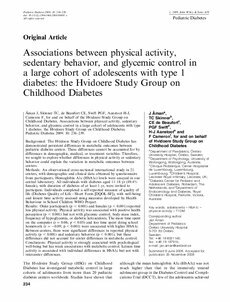 Physical activity was associated with positive health perception (p < 0.001) but not with glycemic control, body mass index, frequency of hypoglycemia, or diabetic ketoacidosis. The more time spent on the computer (r = 0.06; p < 0.05) and less time spent doing school homework (r = 20.09; p < 0.001) were associated with higher HbA1c. Between centers, there were significant differences in reported physical activity (p < 0.001) and sedentary behavior (p < 0.001), but these differences did not account for center differences in metabolic control. Conclusions: Physical activity is strongly associated with psychological well-being but has weak associations with metabolic control. Leisure time activity is associated with individual differences in HbA1c but not with intercenter differences.